Introducing the newest lathe from Oneway, the 1236SD. The "SD" on this lathe stands for "sitting down". Yes, as you can tell from the above picture, the lathe bed, headstock, banjo and tailstock all rotate allowing you to turn while sitting. 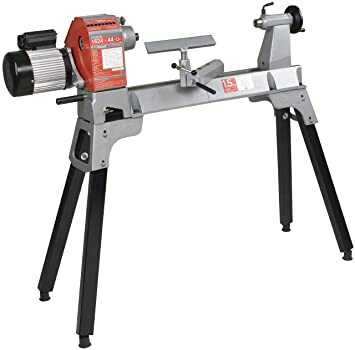 So, this lathe is suitable for people who turn for long periods of time and can't (or don't want to) stand on their feet that long and for the more obvious reason, people in wheelchairs or other sitting devices who can't stand. This really helps a group of people that we've often heard from that have been trying to find ways to either start or to keep turning! Turn perfect spheres on your lathe using this jig. It's easy to set up and easy to use! The jig uses a center base making it self-centering. With the Nova Ornamental Turner, ornamental turning could never be easier. The Nova Ornamental Turner allows you create simple or complex patterns and decorations to turned boxes, platters, bowls or almost any woodturning project. Check out all the details and options here! Consists of 4 segments of high quality soft nylon jaws which are able to be cut and customised by the user to their specific requirements. It is designed to allow woodturners make up a special set of jaws for a job and store them away with the jigs and templates for the project. Universal fitting - these accessory jaws fit onto EVERY chuck in the NOVA range. Easy to use - The four segments of quality nylon can be turned to shape using standard tools. They can be turned, sawn, drilled or tapped. Markless holding - Being made of nylon, they also hold most woods without marking. Vibrant colour - The vibrant NOVA red colour makes it easy to see profiles. By machining the profile after mounting, you can eliminate any errors that may have added up from mounting the jaws to chuck then to the spindle. Maximum holding - You can get full diameter holding on your specific work piece as you can turn out to the exact diameter required. Thick jaw body - user can profile any shape they wish limited only by the fastening heads which are embedded 22.5 mm from the face of the jaws. This gives the turner a great deal of flexibility in what they can do. To learn more about this new products, click here! The DVD costs $24.95 including shipping (plus tax for CA residents). New from Chick and Duck Mfg. The Rim Chuck is a wood lathe chuck that was born out of the same frustration we have all felt. You turn a beautiful vessel and then part it off to find the bottom in desperate need of finishing. You sand it, you scrape it, you try to turn it clean with a forstner bit but still it just doesn't meet the standard you have kept through the rest of the project. The Rim Chuck wood lathe chuck fits the bill. Six pliable rubber jaws secure your project with tenderness and toughness. They hold from the inside or the outside, then put your work up for inspection by the pickiest appraisers. The New Bowers Tungsten Carbide Rasp, available exclusively through Woodturner Tools, has arrived! With input from expert wood turner Bill Bowers, WTT has manufactured three new rasps designed to make the addition of scalloped edges on turned bowls a cinch! The Bowers Rasp is a versatile tool; just take a look at the right and left-handed twists Bill added to his pepper mills in the photo below! The Rasp is available in 3 different sizes —1/16”, 1/8” and 3/16”. The 1/16” Rasp is shown here. Yo-Yo's make a great gift, and turning a one-piece (no glue) yo-yo from a solid block of wood or acrylic is a super skill building exercise as well. Davidson LatheCraft is proud to introduce a feature length DVD video, with a run time of 118 minutes, covering all the important aspects of exotic and collectable one-piece yo-yo design and lathe turning. $22.95 - shipping within USA & Canada included. Traditional safety glasses and sunglasses have arms that break the seals of earmuffs and headsets, letting in sound (average noise attenuation loss of 3-7 decibels*) and creating pressure points against the skull. SoundVision safety glasses attach to the outer surface of earmuffs or headsets with Velcro-like straps and thus preserve full, comfortable ear seals and full protection. Here is the revisiting of some older technology in a new package. Steinert of Germany has released an oval lathe which is sold as a full lathe or separately as a chuck. This unit is not for everyone and it's cost of ~EU 4000 (~$5300) will put it out of the range of the average turner. Steel City Tools has now thrown their hat into the Mini-Lathe market with their latest release. This lathe has a 2 variable speed drive turning as low as 500 RPM using a 1/2 HP Motor. It features a 10" swing over the bed and an impressive 5 year warranty. 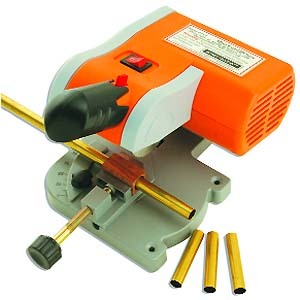 Trim pen tubes and small metal parts up to 1/2" thick with this mini metal cutting cut-off saw. We’ve added special jigs to hold 7mm, 8mm, 3/8" and 10mm tubes in the saw’s clamping mechanism - you’ll get precision accuracy and perfectly square tube ends when cutting your pen tubes with this system. Priced only at $54.95. 1. They are certified FDA Appr'd for food contact. They are made from solid non-magnetic stainless with nitrile o-rings. They will never pit or chip. They are made in PA (USA) for total quality control. 2. They seal tight, you can lay a bottle on its side with no fear of drips. The angle and o-rings were designed to fit various size openings. 3. The low profile allows your turnings to be the focal point by sitting on the bottle not towering above it. This also allows for more turning design possibilities and a stopped bottle will fit in the fridge. You can order these stoppers made with either a threaded or a smooth tenon and can only be ordered directly from Ruth by phone, email or direct mail. For more information, click here to go to Ruth's website! In this double disk DVD (2 hours 20 minutes) , Steve demonstrates all the steps necessary for turning two-step bowls from green wood. Disk one begins with chainsawing the bowl blank from the rough log, rounding the blank on the bandsaw, lathe mounting options, turning the exterior, hollowing the interior of the roughout, and preparing it for drying plus much more. Disk two covers remounting the dried roughout on the lathe, truing the roughout to remove the warped surface, mounting the bowl in a chuck, finish turning the exterior and interior of the bowl, turning decorative elements, reverse turning the foot, power sanding, and finishing the completed bowl. Sharpening the Irish ground bowl gouge on both wet and dry sharpening systems and numerous tips and techiques are also included. To order this DVD, click here! The folks at Teknatool are releasing a new lathe near the end of this year. It's very similar in appearance and features to the old Nova 3000 Lathes. It has a built-in, reversible 1.5 HP motor with 8 speed ranges starting as low as 214 RPM. The swing is 16" and it has 24" between the centers before optional bed extensions. Other features to note are the full swivel head and the vibration dampening stand. We'd like to share with you a book dedicated to segmented turning that was recently published by Bill Kandler. It's the most comphrensive book that we've seen on the topic! It covers all the basics of making segmented turning from design, tools, materials and their selection, and goes through making up the rings to building them out and turning them. To further the topic, the book discusses finishing your project, documenting it and even provides a photo essay on the entire process on one of the segmented projects. Not to leave you wanting, Bill also provides you with project plans for 8 segmented turnings and instructions on how to make his version of a reliable mitre sled. The book is only $30.95 (plus shipping). You can get more details and order it here! Now you can use your Vacuum Chuck on your tool post for carving and finishing your work. This new post comes with two 1/4" pipe ports. One on the side and one on the bottom of the post. You choose which is best for your application. Bottom port requires your banjo to have a through hole. Also supplied is one 1/4" pipe plug for you to use to block the unused port. This post can also be used on your bench with the optional bench mount. On sale now for $89.95, regular price is $99.95. Available in your choice of spindle threads. Looking for a small video camera to use at your club demo's, Woodchuckers' has just the item. They also provide microphones, stands and switchers giving you all the items you need to pull into either a video or TV display. The also sell them as complete packages. Use just like a regular gouge, but without the mess. Attach it to your vac hose and a shop vacuum or dust collector. The chips go naturally into the tube, and so does the dust.